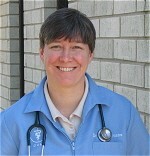 Dr. Evans is a 2007 graduate of the NC State College of Veterinary Medicine. She is a native of Pittsburgh, PA but has called North Carolina home since 1995. She lives in Garner with her family. Her animal family includes two dogs (Woody & Willy), four cats (Chance, Marley, Gus, & Bhodie), and several fish known collectively as the "The Associates". In her spare time, she enjoys trips to the beach, cooking, & reading.